How shall we then see through a glass darkly? Where is the holy in the shadow? “For now we see through a glass, darkly, but then face to face. 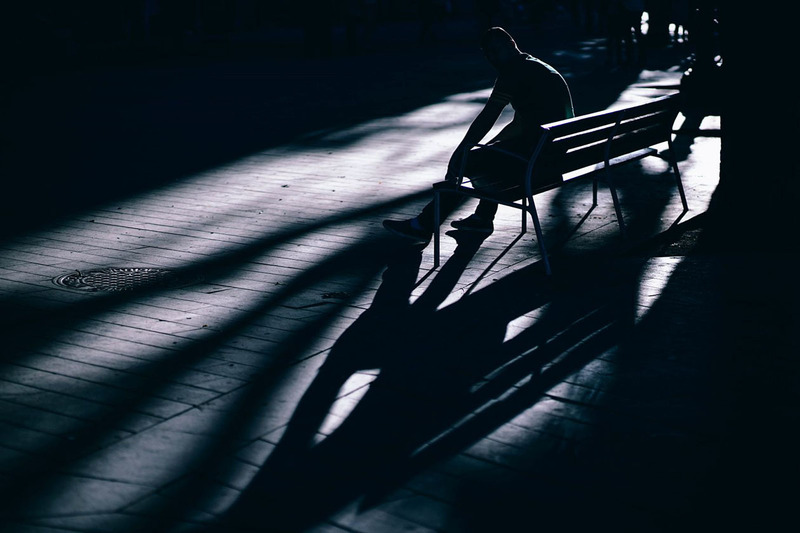 Now I know in part; but then shall I know, even as also I am known.” St. Paul’s words from 1 Corinthians find embodiment in this Igor Ovsyannykov chiaroscuro image of a figure hunched on a bench in Barcelona. We see the man and his surroundings largely through what we cannot see yet know is there from the line of light on the curve of his spine, the horizontal bars of illumination giving shape to his place of rest, the ragged triangle of space that separates the diagonal of his arm from the bow of his body. We know him in part, yet all around pools that full light by which we shall know even as we are known.